During the past year, you told us about your favorite products through online reviews, social media, and at thousands of Pampered Chef parties. This list shows you love to cook hearty meals, indulge in sweet treats, and keep your kitchen stocked with the classics. Here, in no particular order, are the top 13 products you loved this year. This skillet combines the best features of stainless steel and nonstick cookware. The nonstick mesh coating lets you get the perfect sear on meat and leaves fond for pan sauces. And it’s as easy to clean as a nonstick pan. One of the biggest launches this year was the pressure cooker! With 16 easy-to-use functions, you can make almost anything in less time than you ever imagined. Dinners taste better because the flavors don’t escape while cooking, and cleanup is much easier since you’re basically making a one-pot meal every time. It’s no wonder this pan is on the favorites list this year. Between the easy cleanup and perfectly-cooked meals, you can’t get enough of it. 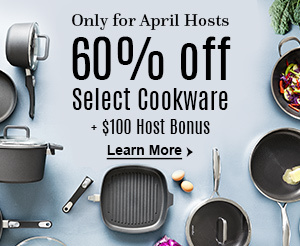 You can enjoy grilling burgers, steaks, marinated chicken breasts, and more throughout the year on this high-quality pan. This will become one of the most-used pans in your kitchen. Whether you’re frying, sautéing, or browning, this will be your go-to pan. Plus, the 2-step removable handle saves space in your cabinets, oven, and dishwasher. This quickly became a family-favorite. Make your own custom ice pops at home in as little as eight minutes with your favorite juice, smoothie, or flavored milk. Who can say no to that? The ice pop maker was designed to make it easier for kids to get involved and have fun making delicious treats. This was a top seller this summer and we understand why. Knowing exactly what ingredients you’re using lets you feel confident in the snacks you give your family. With the newest addition to our microwave tools family, you said goodbye to sad desk lunches and hello to delicious and fresh pasta dishes. One of your favorite things about this cooker is having the ability to make quick, gluten-free meals separate from the rest of your family’s dinner. The paring knives had the best comeback ever! These Pampered Chef favorites are perfect for cutting, slicing, and paring small food. Plus, each purchase of the Kitchen Paring Knife or Set helps contribute three meals to Feeding America® to feed families who need it most. Breakfast got a lot more fun this year! This pan helps you make custom-flavored waffle sticks for your family in no time at all. Your kids will love to dunk them and they’re perfect for breakfast on-the-go. You skipped the deep fryer this fall and fell in love with this fun breakfast pan. It’s never been easier to make your own custom-flavored, or gluten- and allergen-free donuts. One of the most beloved Pampered Chef tools got plenty of love in 2018. Year after year, you continue to prove why this unique tool is a must-have for every kitchen. This is still one of our most popular kitchen tools. Food prep time is cut in half with this easy-to-use food chopper. Plus, it’s the best solution to tear-free onion chopping! This is one of the most important kitchen essentials. Make the perfect cookies, roast your veggies, or reheat last night’s dinner all on this one pan. Use your pressure cooker the right way! Here's a list of 10 do’s and don’ts for pressure cooking so you can get homemade, nutritious meals made faster. I have used the Mix ‘N Chop for years and I love it. It makes breaking up any ground meat as it browns SO much easier. I had an old paring knife that was discontinued. As soon as I saw this new set of four, I ordered it. They are wonderful! Barbara, love the Mix N’ Chop! Also great for breaking up tomatoes for sauces after freezing them. I use it too for decorating sugar cookies, a quick, gentle press, sprinkle with colored sugars and voila! Saves me a lot of time when freezing stuff from garden. A must have for sure. I love the food chopper – it just makes getting things cut up so much quicker…and like they say – no more dripping eyes from the onions!! I could not imagine not having a Mix’n Chop. The Food chopper is in constant use. It spends more time in the dishwasher than the cupboard. It is great for Nuts in Christmas cookies, or vegetables in a salad, soup, or sauce. The cook wear I have I love. Easy to clean and use. My favorite has to be the half sheet pan because it is so usefull and a perfect size. Wow, how does one decide which Pampered Chef item you love the most. I love the chopper and use it all the time but I love the nonstick grill pan for making Panini sandwiches too! One item that I love is my Pampered Chef Consultant! Happy New Year! The NEWEST Cookware is GERMAN MADE!!! You don’t see that often these days! My mom always brought kitchen products back home to the US after our summer visit to Oma in Germany. Now I know why! These pan are really well made and will last a life-time. They are life time guaranteed. WahooO!! The Snack Bar Maker is fantastic! Perfect for making snack bars for kids with allergies. I love the individual microwave pasta cooker. I’m on Weight Watchers so it is measured out when I cook it no going back for seconds.I even make GLUTEN free pasta in it. Where do I start!!! Well, the 10” non stick frying pan is new to me and it works. Cleanup is so easy. I’ve had the food chopper for years. I’m on my second one. Can’t do without it. The microwave pasta cooker is a God Send. I am Mr. Pampered Chef in my kitchen. I already have my wish list put together for my next order. Cooking and cleaning is more enjoyable since I started using my Pampered Chef. Not sure if anyone answered your question. #1 is Stainless Steel and #3 is non stick and a grill pan which is awesome for grilling in the winter and in the summer. I only have 2 of this list. I NEED a cookie sheet! I keep hearing great things about the quick cooker! Sounds so fast and easy! I feel so out of the loop! I haven’t seen the waffle maker or the pasta maker. Clearly, I need to have a party and make the bar snacks! You know I am all about that snack bar maker and making my own chocolate bars now! So quick and yummy! I have the Mix n’ Chop, Food Chopper Paring Knives (purchasing more!) and a couple of Half Sheet Pans. I love all of these products. Not a week goes by that I don’t use the Mix n’ Chop at least 2-3 times. The Food Chopper is so easy for chopping onions, nuts, chocolate, sturdy herbs and many other things, the paring knives are a must have that I am always reaching for, and the half sheet pans are so handy when you want to bake a small batch of cookies, roast a few veggies, dry roast a few nuts for a recipe, etc. I don’t have any of these but I think my grandkids would love the pop sickle maker! I love the snack bar maker and the half baking tray. Stainless steel pan. I own many copper pans and they all stick .